Pearson lands will be under redevelopment soon. The Pearson Residents’ Redevelopment Group (PRRG) is organizing focus groups to ensure that residents’ voices are heard in the planning. PRRG is asking, what should a new Pearson include? PRRG decided that focus groups with residents could discover what the most number of residents wanted. PRRG has worked on planning the focus groups since March. To get started, PRRG went back to 2007 and a report called Envisioning Home. In 2007-2008, Pearson residents led a Participatory Action Research Project that asked what a new Pearson would look like. The results of the report are in this poster and it hangs in a Pearson hallway. 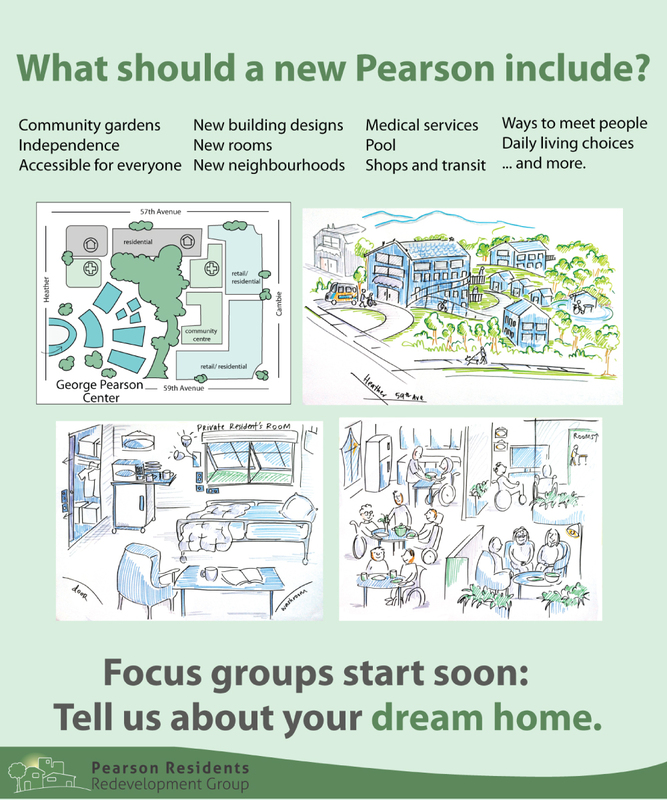 A new Pearson would have housing with easy access to health care and the community, is in a safe neighbourhood, has a choice of rooms, is easy to navigate by wheelchair, doesn’t feel institutional, and has space for family and friends. Since PRRG members also live at Pearson, they began with writing down their own experiences of what a new Pearson should include. Some people wrote that rooms should be spacious and others added there should be nice places to have visitors. For each PRRG member, a new Pearson looked different. With the research and their experiences, the next step was to bring the ideas to life in pictures. PRRG wanted to use visuals to help structure the focus groups. They contracted an artist. PRRG gave the artist their writings and asked him to draw pictures of a new Pearson. The drawings are meant to begin a conversation and show different ideas. Together, the artist and PRRG developed a series of 11 drawings about different areas at Pearson. PRRG directed the process and shaped the final products.The artist submitted drawings to PRRG and PRRG would discuss them. PRRG directed changes so the drawings would represent the groups’ perspective clearly. When the drafts were ready, PRRG organized focus groups starting in August to get residents talking about a new Pearson. To promote the focus groups, PRRG members invited residents individually, with posters and notices, and posted a large sign at eye level in a prominent hallway. More updates from PRRG work to come soon. This entry was posted in Redevelopment. Bookmark the permalink.